Great leaders recognize that they do not have full control of the results they are striving for. Written by Hitendra Wadhwa, Professor of Practice at Columbia Business School and Founder of The Institute for Personal Leadership. The article was originally published on February 13, 2015. We have been taught that all great leaders – like George Washington, whose birth we commemorate on President’s Day – have been paragons of ambition. It is the fuel that propels them forward in life and leadership. It is the clay that they mold into purpose and action. We too should seek ambition and practice it. So why would I invite you to cultivate surrender, a quality that is the opposite of ambition? Because when we study a great life like George Washington’s, we find that while ambition brought them to the door of success, it was surrender that provided the key for them to unlock that door. Washington displayed strong ambition from a young age. Though his origins were humble and he never received a college education, Washington distinguished himself in combat as a young officer in the Virginia militia, served the British with distinction in the Virginia Regiment during the French and Indian War, married a wealthy widow who catapulted him into Virginia’s social elite, and acquired thousands of acres of land along the western frontier. But a series of disappointing experiences left him in contempt of his British military superiors and unhappy with the way remote rulers from England held sway over the economic destiny of their colonial subjects in America. Executives who participate in my leadership development programs observe that the life journey of great leaders like Washington often commences with a personal quest for discovery and achievement. Gradually their vision expands to include the world around them, and each passing experience sharpens this vision until their ultimate purpose emerges in sharp relief. After numerous setbacks and a modicum of victories, Washington was offered sage counsel by some of his generals. The British army was not going to be vanquished anytime soon, they said, and the Continental Army was in no position to engage in direct combat. He would need to place a higher emphasis on preserving his troops by actively avoiding engagement with the enemy except under suitable conditions. What he had expected to be a brief war ended up lasting seven years. Over time, Washington and his men, with support from France, succeeded in demoralizing the enemy and inflicting major losses. The death knell for the British was struck when their commander Lord Cornwallis made a tactical blunder in Yorktown, Virginia, forcing the British to surrender to Washington. By restraining his urge for immediate results, surrendering his attachment that the war take a certain course or end by a certain date, and keeping the fighting spirit alive in his army, Washington was finally able to emancipate the Colonies from British rule. As the British Army withdrew from America, Washington turned his attention to the next stage of his vision, on how the Colonies would be governed. Other revolutionary leaders, before and since, have typically anointed themselves as head of state, and there was a broad clamor among his wide base of supporters for Washington to crown himself king. But to Washington, this would have violated the very principle on which the American Revolution was founded–to give the American people the right to shape their own destiny. He dearly wished for the Colonies to unite in forming a strong federal government that would pay off America’s debts and preserve justice and liberty across the land. But by now he had learned that he should not seek to simply push his agenda through by sheer will. The right conditions had to emerge for the American people to support his vision. He now operated from the sidelines as he patiently waited for the right conditions to emerge for nation building. Even during the war, he had struggled to convince the Colonies to support Congress and the war effort. His troops at times went without food, pay, and shoes as they struggled to get financial support from the Colonies once the initial patriotic fervor gave way to a loss of hope and idealism. Eventually, events such as a farmers’ rebellion in Massachusetts stoked fears of anarchy, of a nation that was ungovernable, and the Colonies were roused to take action by sending delegates to Philadelphia with a mandate for putting a constitution together. Washington was asked to chair this convention. By voluntarily giving up his position at the height of his power four years earlier, Washington had implicitly reassured a public suspicious of authority that he was just the kind of principled and selfless leader they could trust to deploy power to further their, not his, interests. And he had given the world a chance to observe how people, when given the opportunity to choose for themselves, can act responsibly and for the common good. 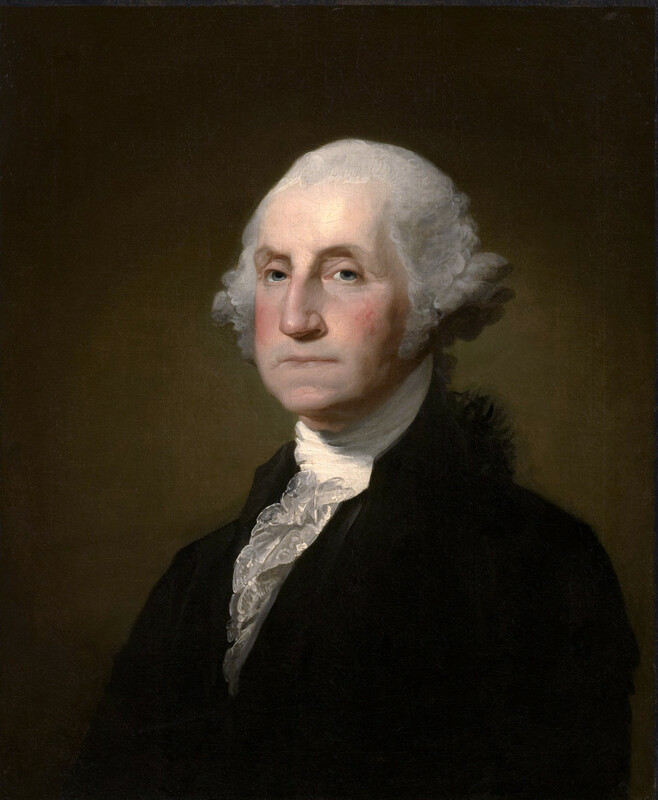 The Colonies ratified the Constitution, and the congressional delegates unanimously elected Washington the first president of the United States, giving him the platform from which he would, over the next eight years, continue his effort to build a United States of America that could be a global beacon of freedom, justice, and equality for generations to come. However, he understood that if he were to pursue abolition, the new, fragile fabric of the Union would be torn to pieces. So he chose to focus on strengthening the Union and surrendered the goal of abolition to the work of future generations. But he did make sure in his will that, upon his wife’s passing, his own slaves would gain their freedom. In my leadership workshops with executives, we see this Washingtonian theme of surrender–of non-attachment to outcomes–play out again and again in the lives of great leaders. In pursuing bold visions, these leaders humbly recognize that they cannot control the precise contours of the outcome or bound the time frame in which the outcome will be achieved. They pursue their ambition doggedly on the outside, while on the inside they practice surrender. This lack of attachment allows them to operate flexibly, to listen to others with an open mind, to engage in constant readjustment, to limit their exposure to unfavorable conditions, and to capitalize on favorable shifts in the wind. Practicing surrender isn’t that easy when you harbor strong ambition. In Washington’s case, it may be useful to add a postscript. As a deeply spiritual man, he saw the workings of a higher force behind all events. At a critical juncture in the Revolutionary War, he stated, “We safely trust the issue to Him … only taking care to perform the parts assigned to us.” Perhaps it was this faith that made him comfortable in surrendering ownership over the outcome even as he relentlessly executed the war. Perhaps if we, too, cultivate an indomitable faith – in our principles, our vision for the future, or a higher power – it will shield us in our everyday battles and give us the courage to practice the key of surrender when, from time to time, we find our ambition has transported us to the door of success only to find it locked.